CXRacing Engine Exhaust Manifold/Header Stud Bolt Kit For. 1990-1998 Mazda Miata 1.6L Engine. 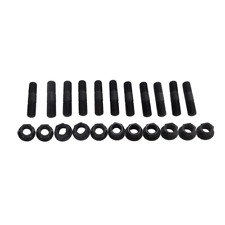 11 Pcs of Studs, Complete Stud Kit for the 1.6L Engine. x11 Stud Hex Nut. 1x Miata 1.6L cast iron turbo manifold. 1990-1993 MAZDA MIATA 1.6L ONLY. Works Perfect for T3/T4 Turbos with internal wastegate. Handle : Usually takes 24 ~ 48 hrs. Modular V-Band Pipe 90 Degree (Short Leg) 90 Degree Stainless mandrel bent module with V band flanges on both ends. 0" Leg and 6" leg, 3" Center line Radius. 1 V-band clamp included. distance from v-band to back of pipe on the zero leg 4.5". 2004-2005 MazdaSpeed Miata turbo w/ Manifold & Heatshields. Will fit all 2004-2005 MazdaSpeed Miata's. This is not a full kit to convert a naturally aspirated Miata motor into a turbo car. It includes everything as pictured, nothing less, nothing more. 1 xUniversal turbo intercooler piping kit : Made of 6061 aluminum. Cnc machined flanges. High quality t04e with a forged turbine propeller wheel! Support up to 350 hp for this small intercooler size - tube and fin style. V Allow to keep PW & AC system. These form the basis where the rest of the turbo system is built around. There is no match for durability and strength for cast turbo manifolds. Cast manifolds are more durable over long periods of constant heat cycles like daily driving. Flange Type: Used Only With T2 Flange Types. Mazda 1.8L (FP) & 2.0L (FS) Engines Only. Improves Engine Performance And Increase Horsepower By Significantly Reducing Exhaust Flow Restriction. NOTE : All of turbo parts and performance may require slight modification in order to fits perfectly. 8 blade T4 compressor wheel. Exhaust inlet: T3 4 bolt flange. Exhaust outlet: 2.274" T3 5 bolt flange. Exducer: 2.755" Trim: 60. Universal application. 12 blade turbine wheel. Inducer: 2.130". Outlet: 2". 8 Blade Type T4 Compressor Wheel. Standard 5 bolt T3 Downpipe Flange. T3 Type Turbine flange. T3 5 bolt flange. T3 Turbine Housing. Handle : Usually takes 24 ~ 48 hrs. Usually takes 24 ~ 48 hrs. 1990-1993 Mazda Miata MX-5 NA. Includes 1 Turbo Manifold. Increase Engine Exhaust Output and Efficiency. Mandrel bent piping made from high quality 16-gauge(1.5mm) austenitic T304 stainless steel. Material: 304 Stainless Steel. Strong & tighter fitting use hair spray between the pipe and coupler. Cnc machined flanges. High quality t04e with a forged turbine propeller wheel! NOTE: This is a universal Kit. Easy Mount Piping Set Included For Bolt-On. Customizable downpipe flange for T25 Style Turbos. NOTE : All of turbo parts and performance may require slight modification in order to fits perfectly. User must follow the direction given and any misuse of this product is at his/her own risk. 94-97 M Edition Convertible 2D. Mazda Miata. 97 STO Convertible 2D. 94-97 Base Convertible 2D. Custom Made Exhaust header. Gasket included. Instantly Gain 10-15 HP. Increase High Air Flow. T3 Turbine Flange. 2.5" V-band Downpipe Flange. 4 Bolt Exhaust Flange. M24 / T4 Compressor Housing. 1x 2.5"" Intercooler. 1990-1993 MAZDA MIATA 1.6L ONLY. T3 Type Turbine. 1x 8 pcs 2.5"" DIY piping kit. CXRacing Intercooler Piping Kit. 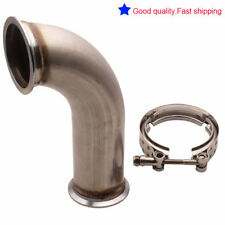 Intercooler Aluminum Piping Silicon Hose T-Clamp. Intercooler x1. Intercooler：. Bar & Plate Intercooler. Piping Kit 3"Aluminum Piping Parts. Works for Many DIY or Universal Setup Applications. Aluminum Intercooler JDM 28"x7"x2.5" Front Mount Intercooler. 12pc Aluminum piping Kit Made of High quality T-6061 Lightweight Aluminum Piping. Increase 65% Air Flow comparing with other Standard Piping. Standard 5 bolt T3 Downpipe Flange. 8 Blade Type T4 Compressor Wheel. Does not include a Wastegate Flange for 35mm/38mm external WG. T3 Type 4 Bolt Turbine flange. T3 Turbine Housing. 1990-1993 Mazda Miata MX-5. Standard 4 bolt T3 Flange. T3 Type Turbine flange. 3.5" V-Band flange. 800 Power Performance Output Capability. Made from High Quality Cast Iron. Handle : Usually takes 24 ~ 48 hrs. 10 Blade Type Turbine Wheel. Introducing our new high performance T3/T4 Turbo Kit! After a basic install and tune, the only way other drivers will be able to see your vehicle is from behind, as you drive past everyone else with the highest velocity and acceleration your engine can reliably handle. T4 Compressor Wheel & T3 Type Turbine flange. Aluminum Piping Kit. 36" Stainless Steel Oil Feed Line Kit. 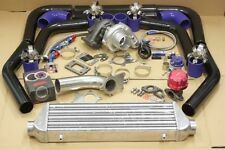 For the turbo kit to be complete & functional, an turbo manifold as well as downpipe is required. Too small of a wastegate can cause boost creep, while too large of a wastegate will increase boost lag and. One of the most important components in a well designed turbo kit, is a properly sized wastegate. Rev9 Universal RS-Series Turbo Wastegate; 38mm 2-Bolt Type. 38mm 2-Bolt RS-Series Universal Wastegate. Simple One Step Process for Removing or Installing Different Wastegate Springs. AND WE WILL DO OUR BEST TO FIX THE PROBLEM. 1994-2005 Mazda Miata 1.8L. CNC Machined T-304 Mandrel Bent Stainless Steel Piping And TIG Welded Steel Flanges. Improves Engine Performance And Increase Horsepower By Significantly Reducing Exhaust Flow Restriction. (NO Instruction included!). CNC Machined. High Polish Finish. Our wastegates include spring(s), hardware, gaskets and flange(s). kit or if you are just changing your existing setup. This is one of our quality wastegates that can be used to. T3 Type Turbine flange. T3 Turbine Housing. 7 Blade Type T4 Compressor Wheel. Standard 5 bolt T3 Downpipe Flange. T3 5 bolt flange. Turbine Specs Turbine. 63 A.R. 12 Blade Type Turbine.